As often stated, you have to experience VR to truly believe. Arcade settings are perfect places to introduce someone to the immersive virtual experience while having a bit of fun with friends and companies are certainly taking note. HTC valued the VR arcade market at $100 million, revealing more than 120 titles signed up at the start of this month and we reported on them opening Viveland in Taiwan only a day before that. The VR arcade scene in China is booming these days. We’ve even seen some of this scale popping up in the U.S., such as The Void, which recently debuted a Ghostbusters experience. But now, we’ve got a new development as Zero Latency expands from Melbourne, Australia to Orlando, Florida and brings the US their very first warehouse-scale free roam virtual reality facility. Zero Latency equips you with a gun, headset, and backpack in a warehouse where you and other players’ movements are tracked by cameras all over the area. That tracking is utilized to reflect your moves and actions in various scenarios, including being overrun by zombies. The Orlando facility, announced in a press release that the facility won’t be as large as the one in Australia (2k square feet vs roughly 4k), but the program will scale with no issues. Beyond that, they’re bringing over the same gear including Razer’s OSVR HDK 2.0 VR headset, the Alienware powered backpack PC, and players will be tracked by Zero Latency’s proprietary technology. 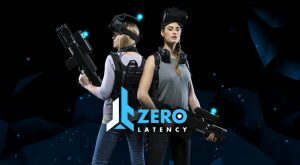 Zero Latency’s facility in Australia opened to a wave of excitement in the form of six-week wait lists for the experience and will be opening in Spain to go along with the existing establishment in Japan. The warehouse-scale experience will be sharing space with a Main Event facility in Pointe Orlando near the Orange County Convention Center, and it’ll be the first Main Event in Florida. For more information, visit the Zero Latency official website.